I have wanted to try this product for so long as I have heard such rave reviews about it, but in Ireland it retails for €17.00 which I found hard to justify for such a tiny bottle. I was also skeptical as I have tried and tested so many spot treatments and had never found one that works. I am lucky that I actually don't get many pimples but when I do get the odd few they tend to be the massive underground spots that are more like boils. I was starting to think no treatments work on these type of spots and that unfortunately they just have to run their course which can take up to a week. I am ashamed to admit I am also a picker and cannot leave them alone so they are always angry, red and impossible to cover up. I asked for this product for Christmas and was hemming and hawing on weather to ask for it, as at the time my skin was behaving and was pretty clear so I didn't feel I had a need for it. Well, thankfully I got it because just after Christmas my skin when into melt down, due to excessive junk and the monthly visitor. My face erupted in approximately four horrific underground craters. Instantly I whipped out the Origins Super Spot Remover. Low and behold does it exactly what it says on the bottle! It is my saviour. I have only owned this for two weeks and I would consider it holy grail territory. Now I don't want to put you under any false illusions by no means did the spots just vanish into thin air after one application, but when I felt the little pesky buggers under my skin I applied a tiny amount of the spot treatment on the affected area twice a day and the spots slowly disappeared. They took about three days to vanish which is a huge improvement as it usually takes a week. They also never got red and angry or came to the surface so I was able to cover them perfectly with concealer. And a major benefit was that at no stage did the skin around the offending areas become dry and flakey. That tends to be a major problem with my skin, that when I apply harsh products my skin reacts and this makes the spot stand out even more. I would highly recommend this product if you suffer the same cursed under ground spots as me. Regarding the steep price tag, after using it I genuinely feel it is worth every cent and as you only need the tiniest amount of product so it will last a long time. I think I will write an entire post dedicated to all the spot treatments I have tried and tested. I have some more affordable alternatives that may help if some of you suffer from pimples rather than cysts. 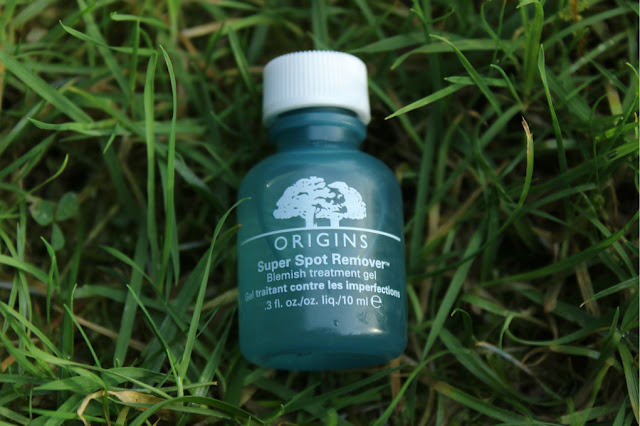 Have you tried Origins Super Spot Remover? What do you think of it? Or have you any other holy grail spot treatments? Please let me know in the comments. I've heard such good things about this product. Fortunately I don't get spots/blemishes that often, only the odd one or two, so I don't think I would purchase. Are you sure that it’s not good cause was thinking of buying it. I'll have to tell my friend about this....she has a problem with acne and has been looking for the perfect product for a while. Thanks for introducing me!! I've never heard of this before - will definitely have to try, thanks! I can suggest to my friend who is looking for a solution for her underground spot.